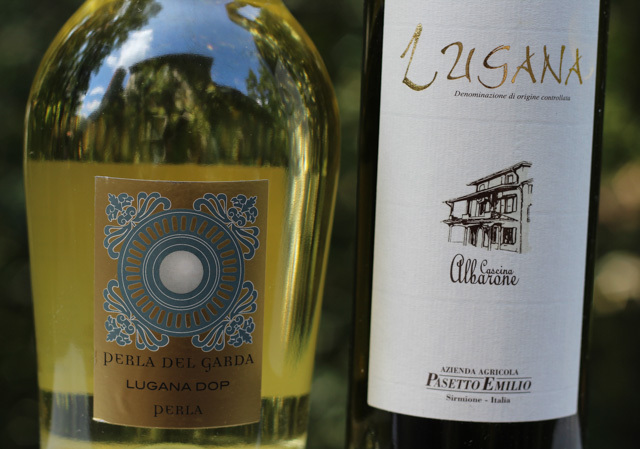 Have you heard of Lugana wines? This month the Italian Food, Wine, & Travel group is taking a closer look at the growing popularity of Lugana wines. The Lugana DOC was established in 1967. It is a small wine growing region in northern Italy located on the southern shores of Lake Garda near Verona and lying between Lombardy and Veneto. The soils are chalky limestone and clay, rich in mineral salts. 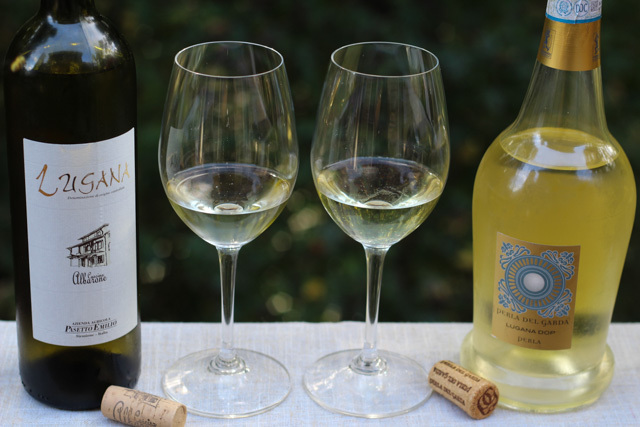 The region produces white wines exclusively and is known for its dry white wines produced from the Trebbiano di Lugana grape variety (known locally as Turbiana). 2 – Lugana Superiore – Aged for at least one year. Common aromas and flavors; herbs, apples, citrus fruits, hazelnuts, spices, and minerality. More noted complexity. 3 – Lugana Reserve – Aged at least 24 months including six months in the bottle. Common aromas and flavors; flint, balsamic, and minerality. Even more noted complexity. 4 – Lugana Late Harvest – A new experimental wine. Made by over-ripening the grapes on the vine. Modeled after the German Spätlese wines. A soft textured wine, heavier, with the acidity balancing the sweetness. Pale lemon with a green hue in color. Medium+ acidity and medium- bodied. Notes of green pear and citrus with a soft texture on the finish. Nicely balance. Pale lemon with a green hue in color. High- acidity and medium- bodied. On the palate bright citrus, green apple, slight bitter almond, and an oily texture. Disclosure: The wines were provided to me as media samples. All opinions are my own. Trebbiano di Lugana is the perfect match for seafood, poultry, light pasta, and vegetarian dishes. It’s bright acidity, and refreshing characteristics are the ideal pairing for simply prepared dishes made with top quality ingredients. 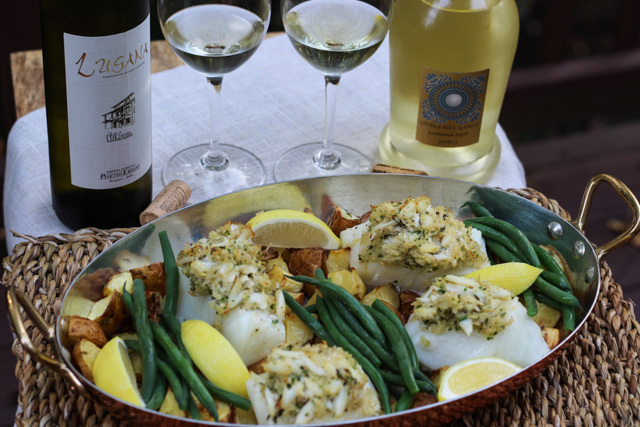 I paired the Lugana wines with Crab Herb Crusted Chilean Sea Bass, new Yukon potatoes, and fresh green beans. A simple recipe with top quality ingredients paired with a crisp refreshing Lugana wine. Preheat the oven to 425F. Line a baking sheet with parchment paper. Place the the sea bass fillets on the pan. Season the fillets with salt, pepper, 1 teaspoon thyme leaves and 1/4 of the grated lemon zest. In a medium bowl, mix together all the remaining ingredients. Season with salt and pepper. Divide the mixture between the fillets and gently press the mixture on the top of the fillets. Bake for 15-20 minutes or until temperature reaches 145 F on an instant-read thermometer inserted in the center of the fillet. 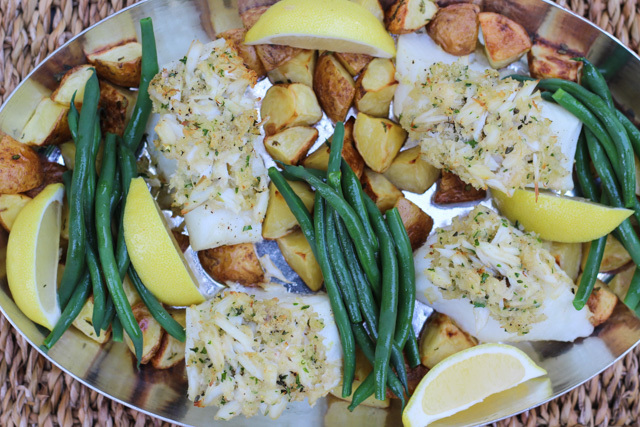 Serve with lemon wedges, new small potatoes, and green beans. Nice pairing Jane! I too find Lugana seems to like seafood and the crusting/herbs on this Seabass seal the deal. I’m hoping to find a riserva, late harvest and spumante to try. Have you had them? Yes, I was fortunate to try a riserva, late harvest and an orange Lugana at the Wine Bloggers Conference. There are only two producers of the late harvest and only one producer of the orange. 70% of the wine is exported; Germany, UK, and Denmark are top importers of Lugana. That is one delicious looking platter of wonderfulness there…I’m sure that the pairing was lovely. That looks like a delicious pairing!! Thanks for sharing, Jane. Looks good Jane! How did you like the session at the conference? The Lugana tasting was very interesting. We tasted three different styles; Lugana, Late Harvest, and an Orange. That looks like a perfect pairing with these wines. I’m sure it was delicious!